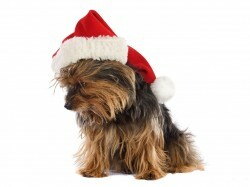 As a professional dog trainer, I am saddened to see so many families get puppies as Christmas presents. I am not a scrooge and I know kids can beg their parents all year for a puppy and it seems that Christmas is the perfect time to deliver that new family member. There are perils in doing that this time of year – mostly dangerous for the puppy as shelters across the country get bombarded with Christmas puppies a few months from now. Puppies take time. Lots of time. To have a well-adjusted dog, you need to positively expose your new puppy to 100 new things in 100 days. Once the kids go back to school and you go back to work, who will let the puppy out for a mid day outing and pee break? Who will walk the dog? Who will guide the puppy in this crucial time of learning and forming associations? After work It is usually dark. Morning walks this time of year are frigid. Puppies and young children must be supervised 100% of the time. That will add a TON of stress to your family right at holiday time. Puppies are expensive! Not only is there a purchase or adoption price, you will need a series of vaccines for your new puppy. Plus collars and leashes and crates and toys . . . the holidays are expensive enough without bringing home a life that will need lots of time, attention and funding. So what can parents of dog-crazy children do? One nice family thing to do is visit local animal rescues and bring donations from the entire family. Check out dogs that might work for your family and go back after the holiday craze is over and spend more time with dogs you felt a kinship with. Purchase puppy dog training books and read together. A lot of parents get giddy thinking of how happy their child will be to get a puppy for Christmas. Those of us who have worked in rescue see something entirely different and that is the sad faces of the parents and especially the children when they feel they are forced to turn that puppy into the pound in a few months as no on had time provide the leadership that puppies (and dogs) need. Think it through and see if there is a better time to bring home a new family member.